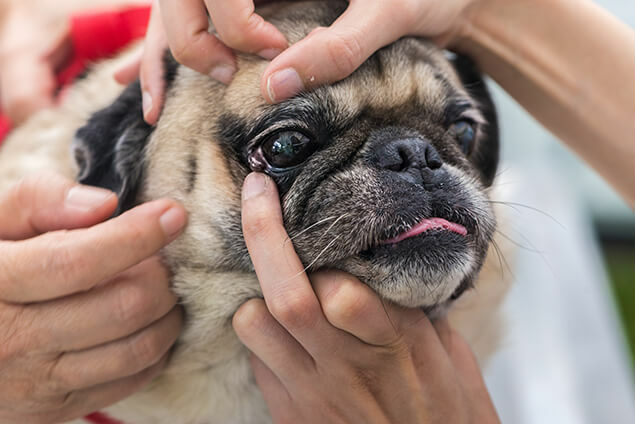 Do you have a dog that needs continual cleaning under the inside corner of the eyes, next to the nose? Do crusts sometimes form and cause irritation to the skin in that area? This is a common problem, especially for some breeds. For lighter color dogs, the brown staining is prominent and causes many owners great anxiety.They seek desperately for a cure for the problem. More important is to find the cause of the excessive tearing and staining rather than “cosmetic band-aid” treatments. Ingrown eyelashes or growths on the eyelids that constantly rub the eye increases tear production. Although not as common, allergy irritation to the eye also increases tears. This is a common problem in the flat faced breeds. The pressure of the eye to the eyelid “pinches” of the tear duct and its opening. • Eyelids that are turned inward against the eye. This genetic birth defect is called “entropion.” The inward eyelid tuck can cause the eyelashes to irritate the eye and increase tear production while occluding the tear duct at the same time. Infections or damage to or around the eye can cause scarring that blocks the tear duct opening. Some of the breeds listed inherit genetic defects that results in a lack of an adequate tear duct system to develop. 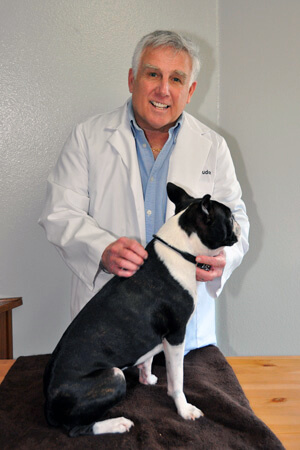 Watch for the next blog on the diagnosing and treating tear staining in dogs.